Pu erh (pronounced “pooh-air”) is fermented tea. It is only produced in China, in a southwestern providence named Yunnan. Pu erhs are unique in the tea world because they can be aged. The year of a “vintage” pu erh impacts its value. It can be sold in loose-leaf form or compressed into different shapes, including bricks, coins, tuochas, or round cakes wrapped in paper. 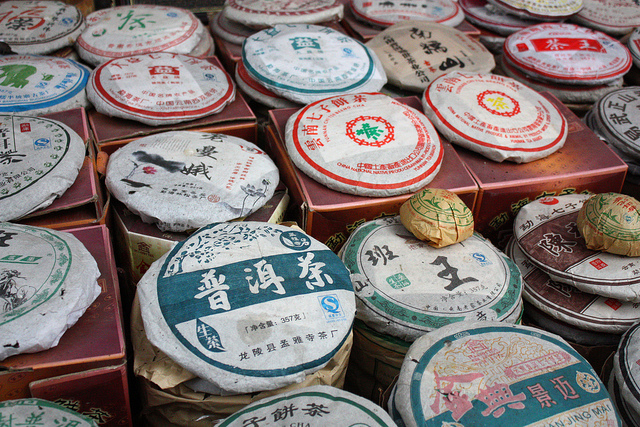 Pu erh cakes sold in their decorative wrapping. “Pu-erh tea sold in the Muslim quarter of Xian.” By “abstract duck.” CC BY-SA 2.0. After the Camellia sinensis tea leaves are plucked, they are pan fried, which reduces the enzymes but does not eliminate them. The leaves may be dried either in the sun or under sheets. Both methods cause bacteria to grow that change the flavor and quality of the tea, known as fermentation. The particular fermentation process determines the type of pu erh, as discussed later. The pu erh market is a world unto itself. Similarly to wines, the aging and fermentation process affects a pu erh’s perceived value, as does the area in which the tea is produced. Add to that the visual appeal and packaging opportunity of cakes, bricks, and the like, and you’ve got an obsession in the works. 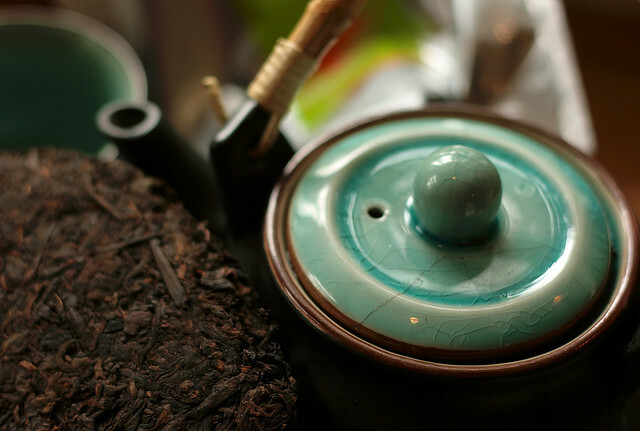 The very highest end pu erhs, which are rarely available outside China, attract collectors and connoisseurs who are quite particular about what makes a good tea and what doesn’t. Some of the rarest pu erhs have even been counterfeited. Me, I just think pu erhs are fascinating. I’ve never tasted anything quite like them before or since, and their array of unique flavors – earthy, mossy, mineral – embody the reason I think tea is way cooler than people often realize. They’re the tea you wouldn’t expect to like, but they’re amazing. There are two types of pu erh tea: raw and ripe. (They’re sometimes called “uncooked” and “cooked,” but that’s a misnomer. There’s no cooking in the process.) Although they fall under the same class of tea, their qualities are almost opposite. 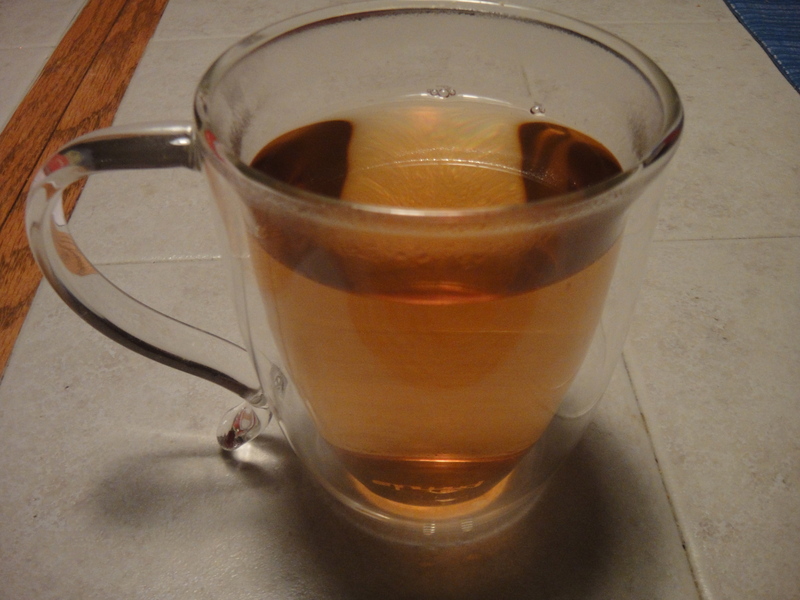 Raw pu erh tea ranges from pale yellow to light red in color. Raw pu erh loose leaves. 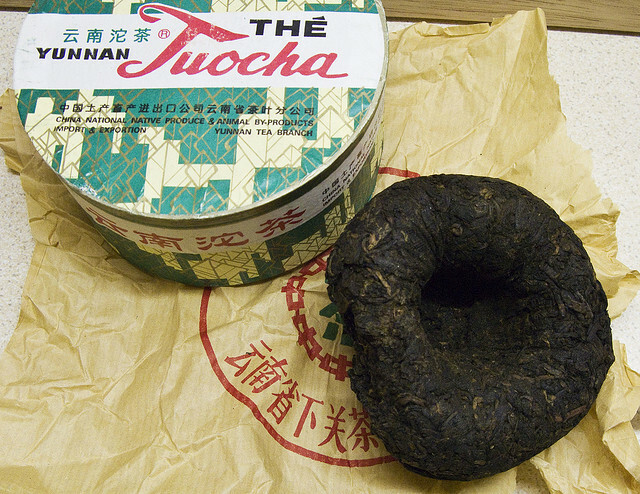 A raw pu erh, known as a sheng, is is the older of the two varieties of pu-erh. 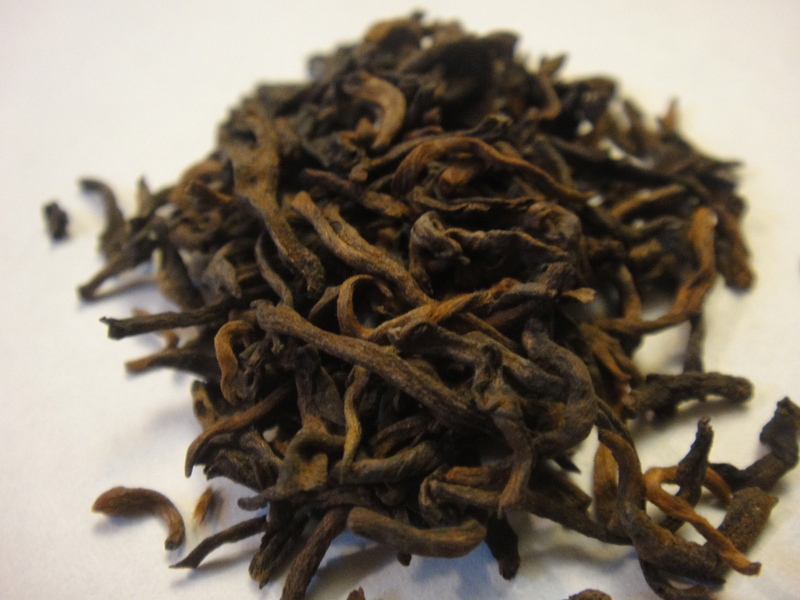 Shengs, considered the “true” pu erhs by many purists, are what the collectors and connoisseurs are obsessed with. Ripe pu erhs range in color from this rich, deep red to an opaque dark brown resembling coffee. Ripe pu erh loose leaves. 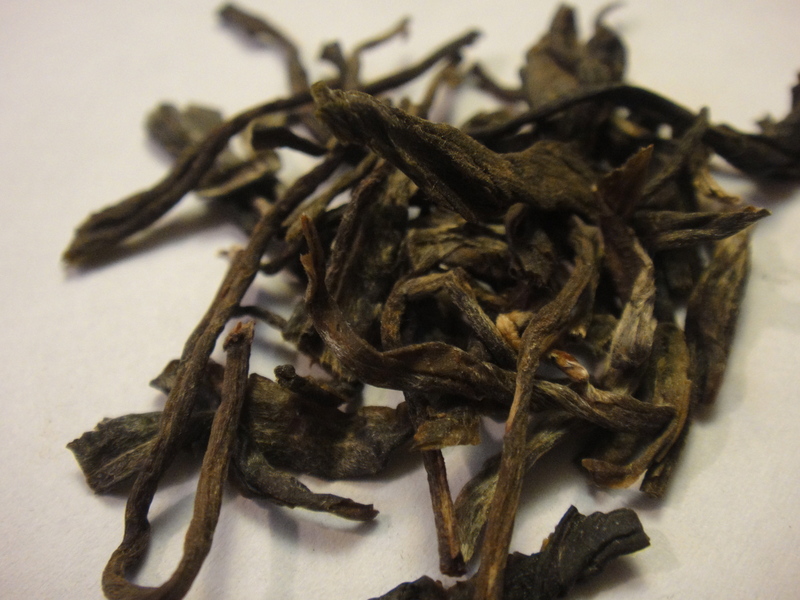 A ripe pu erh, or a shu, is a VERY recent innovation from about 1973. All pu erhs from before then are raw. Artificially fermented after drying and rolling. Inexpensive shus can smell like fish – rinse leaves (see How to Prepare) to fix this! It doesn’t taste like the name sounds. I promise. Actually, pu erhs have unique, full-bodied flavors that I haven’t found anywhere else. Raw pu erhs can be fresh and cleansing, and ripe pu erhs can be deep and comforting. Need a coffee substitute? Because of their thick, smooth flavor ripened pu erhs are often said to make good coffee substitutes. Personally, I don’t think they taste like coffee at all, BUT they’re delicious, robust, and quite caffeinated without causing the jitters. It can be healthy. Pu erh teas are frequently cited as having antioxidants that can reduce cardiovascular disease and even cancer. Some studies even show pu erh lowering bad cholesterol. Toucha Tea by David Davies. CC BY-SA 2.0. Rinse the leaves before steeping. To do this, pour hot (preferably near boiling) water over the dry leaves, let it sit for ten seconds, and pour the water out. 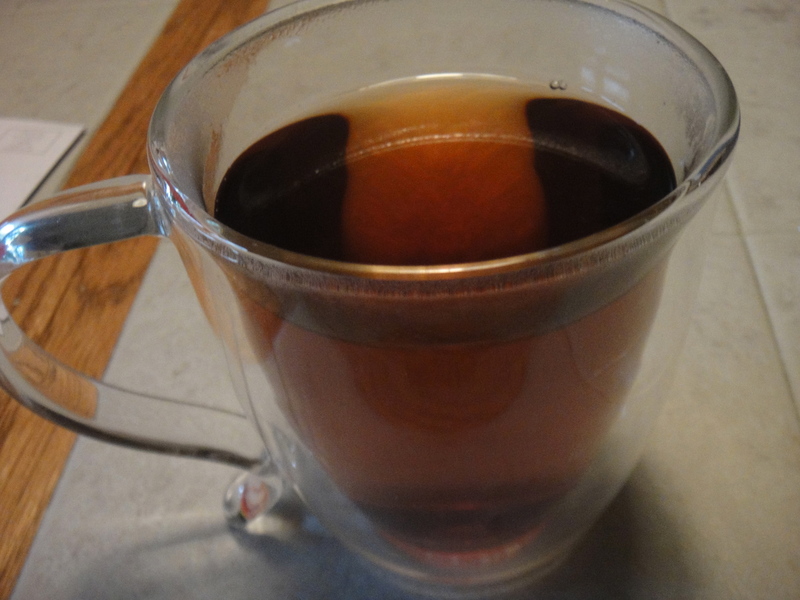 A lot of people are turned off by their first pu erh because the leaves were not rinsed. My bitter sheng and fishy-tasting shu improved tenfold after I rinsed the leaves! Steep time: 3 – 5 minutes, can go up to 10. Pu erhs are MUCH more forgiving of long steeps than many teas. They can also be resteeped. It’s much easier finding good pu erhs in China than in the United States, since not all American vendors offer pu erh. However, here are some places to start. Love pu erhs? Loathe ’em? Tell me in the comments below! Niceeeeeeee. Puer is my favorite by far. I have so much information I want to gather and organize its amazing. You are doing a great job presenting this information! I hope to see more! Thank you for commenting! Pu erhs, particularly shus, are among my favorites too. I plan to do more posts on them in the future!